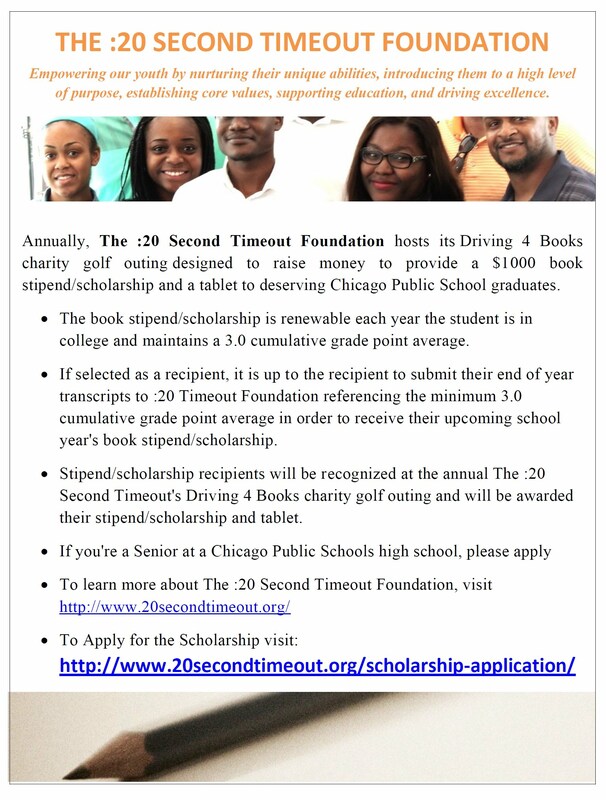 Annually, The :20 Second Timeout Foundation hosts its Driving 4 Books charity golf outing designed to raise money to provide a $1000 book stipend/scholarship and a tablet to deserving Chicago Public School graduates. The book stipend/scholarship is renewable each year the student is in college and maintains a 3.0 cumulative grade point average. If selected as a recipient, it is up to the recipient to submit their end of year transcripts to :20 Timeout Foundation referencing the minimum 3.0 cumulative grade point average in order to receive their upcoming school year's book stipend/scholarship. Stipend/scholarship recipients will be recognized at the annual The :20 Second Timeout's Driving 4 Books charity golf outing and will be awarded their stipend/scholarship and tablet. If you're a Senior at a Chicago Public Schools high school, please apply!